Ethiopian Defense force coordinated with Somalian Defense Force to launch strong counter-offensive, Ethiopian Broadcasting Corporation (EBC) reported on Sunday citing a statement sent to it by the Defense Ministry. 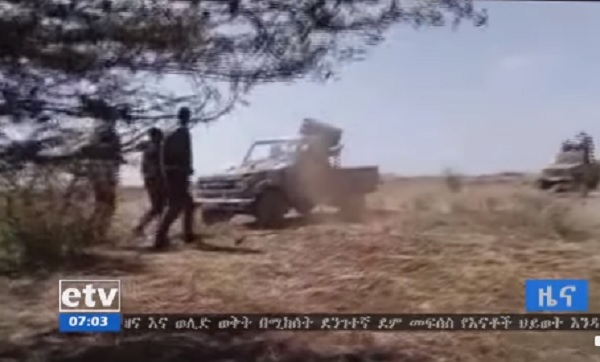 In consequence, the Islamic Militant group sustained heavy loss, Ethiopian Defense Force. Nine Land Cruiser vehicles loaded with explosives have been neutralized and destroyed before they wreak havoc. As well, over 66 Al-Shabab militants are killed according to the report by EBC. On the Other hand, U.S. officials have claimed that they have killed 52 al-Shabab militants in an airstrike that targeted Somalia’s Middle Juba region but no civilians were killed, according to VOA report. Last week on Friday, Ethiopian military conveys serving under the command of African Union Mission in Somalia (AMISOM) were ambushed as they were travelling from Buurhakaba to Baidoa near Somalia’s port of Kismayo.